Rolex produced a limited number of dials in the early 1960s featuring an "exclamation" mark, which we see on this watch. Scholars hypothesize that this designates a transitional period where Rolex lowered the radium amount on the dial. Since "exclamation" mark dials were produced for such a short time, examples like this are very rare. The numerals on this wristwatch have aged with warm patina, which consistently match the hands. The lacquer dial is intact, and all the gilt lettering has been preserved in excellent condition. This timepiece is fitted with a small tipped luminous hand, along with ‘Cornino’ pointed crown guards, which is correct for early examples. 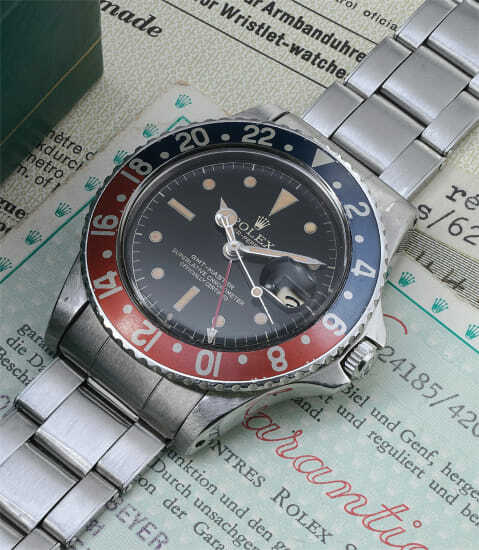 The present watch is particularly noteworthy as the bottom of the lug is stamped with a Beyer number that is furthermore repeated on the guarantee, reinforcing scholarship that the storied retailer had stamped their watches with an internal code. The red section of the bezel has faded to a dark orange tone, while the blue sector displays a vibrant blue color. The present watch is a truly fantastic example, complemented by the addition of its chronometer certificate, guarantee and fitted presentation box. Furthermore, the case is presented in excellent condition with crisp edges and sharp finishes.